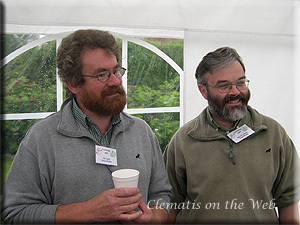 Ian (left) and Richard at the IClS tenth anniversary celebrations. Ian Lang and Richard Green are best known in the clematis world for 'Clematis on the Web' which they maintain with support from the University of Hull, UK. What began as Ian's interest in clematis turned into a passion when they moved to a new home in 1995. The property had almost one third of an acre of garden, much more than their previous house, and soon much of it was filled with an increasing range of clematis. Every year, for several years, areas of grass disappeared to make way for more flower beds. Today the garden is home to an extensive collection of clematis, many from the old USSR, as well as a substantial number of 'old' roses, shrubs and hardy perennials. At the last count there were in excess of 500 different cultivars and species forms. Ian is the real gardener, Richard has a Class I weeding licence! 'Clematis on the Web' was set up in 2000. It sprang from a conversation in which the pair were bemoaning the fact that the clematis world seemed to have done nothing to commemorate the millenium. It turned into a discussion of what they might have done (a reference website for clematis) and the idea was born. The University of Hull, where Richard was working, agreed to host the site as part of their academic library provision. The rest, as they say, is history. Richard deals with the database and the technical side of things whilst Ian provides most of the photographs (although nowadays, more and more photographs are being contributed by clematis enthusiasts around the world). At the end of 2005 they registered Ian's first two named clematis 'Pink Pride' and 'Lynne' followed, in 2007, by 'Together' and 'The Blue Cross'. Ian and Richard have written a number of articles for the International Clematis Society and the British Clematis Society. In 2018 they were awarded the International Clematis Society's Golden Clematis Award "in recognition of outstanding contribution to the study and culture of clematis" through Clematis on the Web.